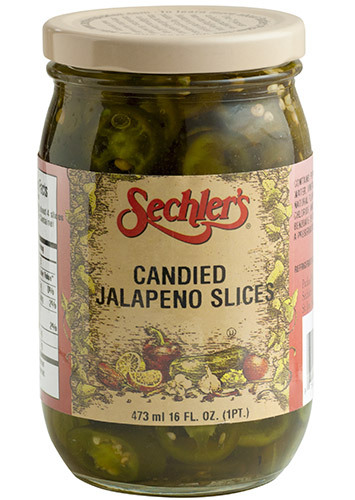 16 ounce Candied Jalapeno Slices are twice sweetened with pure sugar. From Brian Hutchison of Portland, Indiana on 4/5/2019 . The perfect combination of sweet and heat. These little guys are great on sandwiches, in salads, with bbq, etc. Give them a try. From Dana A of Irvine, California on 12/19/2017 . I personally don’t eat these (i love the candied sweet pickles), but my husband and 12 year old son devour these!!!! I bought them on a whim when i was filling a 6 pack of mixed jars and so glad I did! I ordered extra this year to give out as gifts. And with Sechler’s excellent customer service and FAST shipping-the arrived quickly and perfect! From Joanna J. Vidito of Visalia, California on 11/17/2017 . They are not too hot and not too sweet. My family loves these pickles. They are great in sandwiches and on the side with meat dishes. I tried one jar last year and bought a 6 pack this year. SO GOOD! From Gary of Henderson, Nevada on 10/22/2015 .